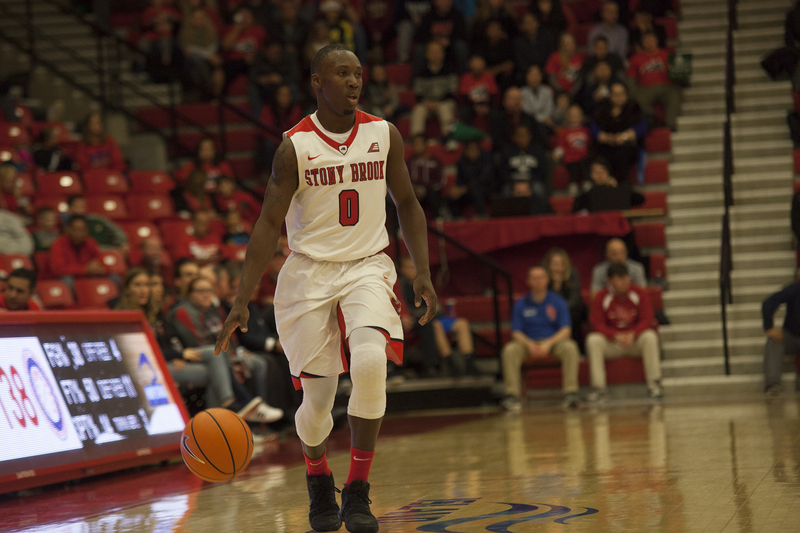 In a key conference matchup at home on Saturday, senior guard Jaron Cornish helped Stony Brook Men’s Basketball bounce back from a first-half slump to beat UMass-Lowell by a final score of 76-65. Cornish dropped his career-high 30 points against the River Hawks. After putting up 13 points in the first half, the senior exploded with an unanswered nine-point run that highlighted his 17 second-half points and gave the lead to the Seawolves for good. Cornish would also finish the game with six rebounds, four steals and an assist while shooting 61 percent from the field and 50 percent from deep. This was the guard’s highest scoring game, topping the 22 points he dropped against Norfolk State on Nov. 27, and the most points scored by a Seawolf this season. Another solid offensive performance came from sophomore guard Elijah Olaniyi, who added 15 points, eight rebounds and two assists on 86 percent shooting from the field and 50 percent from three. Olaniyi concluded his third game in a row with double-digit points on 66 percent shooting from the field and has knocked down eight of 14 from three. Redshirt-junior forward Akwasi Yeboah logged 13 points and 12 rebounds, recording his seventh double-double for the season and his fourth in the last six games. Defensively, the charge was led by sophomore center Jeff Otchere, whose three blocks continues his streak of four straight games and nine of ten America East games with multiple blocks. Otchere improved to sixth place with 63 total blocks this season in the NCAA. After losing two straight games to Vermont and UMBC, Stony Brook has come back strong with three straight conference wins. First, Olaniyi dropped his career-high (and at the time a team season-high) 28 points against Hartford. Then, the team knocked down thirteen 3-pointers that were lead by freshman guard Miles Latimer’s five makes. Then on Saturday, Cornish took the team season-high from Olaniyi. When asked about the team’s ability to have players step up in big moments, both the players were in agreement on its usefulness to the team. “High powered team. Literally, anybody on the starting five and even guys on the bench could go off on any given night and I just think that’s just one of our biggest attributes and something for other teams to fear,” Olaniyi stated. The Seawolves take on the New Hampshire Wildcats next on Saturday, Feb. 16 at 1 p.m. in Durham, New Hampshire before beginning a three-game homestand at Island Federal Arena the following week.